It's been awhile since the last release of a Godzilla movie. Maybe the average person doesn't take these things into consideration, but I do. Godzilla: Final Wars was the last adventure to be released featuring our favorite giant monster. I've been jonesing for a new one since then. You don't realize how fast the time goes. It feels like it was only a year ago but it was over ten. Naturally, when I heard that there was a new installment coming to the series and it was from an American studio, I was excited and a little nervous. You see, the last American made Godzilla movie didn't go over to well. It was a fine enough giant monster movie, but it wasn't Godzilla. GINO (Godzilla In Name Only) or Zilla, as he was called by fans, lacked the majesty and the sheer power of the Japanese version. The film might have been fine as a reboot/remake of The Beast from 20,000 Fathoms, but as a Godzilla movie, it failed quite miserably. And now we were going to be subjected to a new one and it was going to be directed by someone that I hadn't even heard of. So I found the movie that got him the gig, Monsters, and watched it. Suddenly, I wasn't as nervous as before. Here was a man who got the genre, mixing human drama with the monster action in a balanced and fantastic way. And he did it all doing the effects, which were very good, on his computer at home. Imagine if Gareth Edwards, the director behind said film, had a real budget behind him. We don't have to imagine any longer. Godzilla (2014) is a worthy addition to the venerable series of Japanese films, far eclipsing the original American remake and earning its spot as a fine film in its own right. Right from the credits, you get a glimpse of Godzilla, as the stylized entry to the film is a montage of newsreels and articles on a giant monster (Godzilla) that they were conducting nuclear tests to try and destroy. That's the last glimpse you'll have of him for awhile, as we delve into the human drama, starting in the Philippines, where a mining operation has uncovered an odd discovery--a giant skeleton and two eggs, one of which has hatched and the contents of which have fled the area. It's destination? A nuclear power plant in Japan, which it destroys, traumatizing Joe Brody, played by Bryan Cranston and sending him on a mission to find out what exactly caused that disaster. We jump to fifteen years later, where Joe is still searching for answers, leading him to try and get into the quarantine zone that was set up around the lost power plant. His son has to bail him out of jail when he gets caught and now Ford Brody and his father find themselves on the trail of a cover up that is hiding something that may end up destroying the world--monsters! After this build up and introduction to the cast that we'll be sticking with for the rest of the film, including Ford the younger's wife and child, the movie sets us up for a roller coaster of action sequences that find the monsters from the eggs hatching and terrorizing the Pacific as wreak havoc on anything nuclear in their path, as that is what they feed on. Fortunately, there's an ace in the hole for the Earth and its name is Godzilla and he doesn't seem to like these upstarts trying to take over his world. The monster designs are well done, with the MUTOs (Godzilla's opponents) bringing to mind Gigan mated with some odd insect. Their alien look sets them apart and helps us know that they are the ones who do not belong on this planet. Godzilla is majestic and powerful looking, updated for a modern age but still retaining the form and figure that we've become used to over the past 60 years. His role is of a force of nature, a balance setter who has little regard for anything other than his mission. And he's damn expressive. While in the past, the suits have given us some personality to Godzilla with sneers and the like, here in CGI he expresses more character than some of the human in the cast as he tries to destroy his enemies. When we first see him, it's a a grand moment, but we are made to wait until we can really see him cut loose against his foes. When that happens, it's well worth the wait and almost transcendent in its awesome brutality. I liked this less is more approach that they used in the movie, teasing us with the battle they know we want to see until the end. It works well and when you get that final release, the wait has been worth it. Plus it's not like you're sitting there watching paint dry. There is monster action, even if it isn't battles, giving us some wonderful creature shots like Godzilla swimming through the ocean, flanked by aircraft carries as they all head to the final battle. 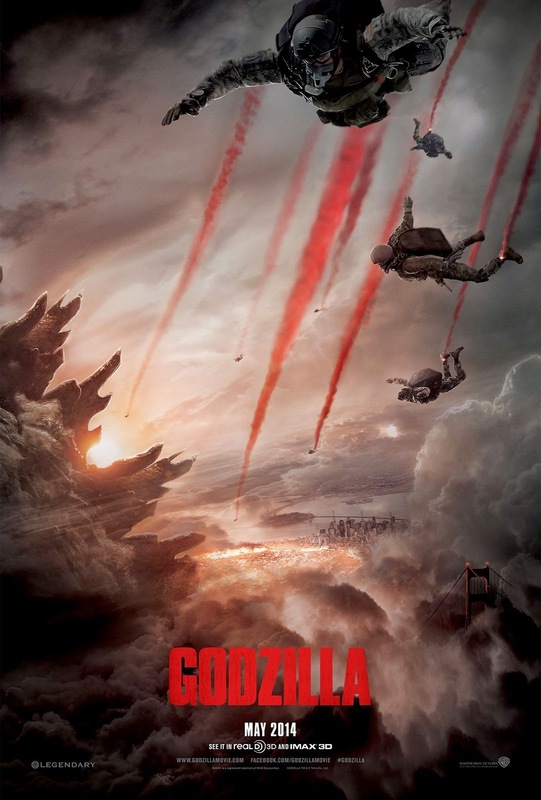 All in all, it's a great movie and moreover, it's a great Godzilla movie. Judging by the box office from the weekend, other people are feeling the same way and they've already greenlighted a sequel. Edwards says he would like to do a Destroy All Monsters style movie for the next one. I'm very OK with that. Check it out and go, go Godzilla!